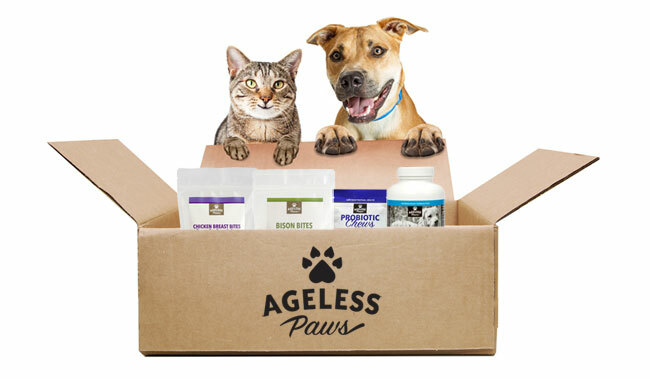 Ageless Paws Turkey Heart freeze dried treats for dogs are 100% grain-free and naturally high in protein. No additives or fillers, no artificial colors, flavors or preservatives, these healthy dog treats are made with only one ingredient – USA-raised turkey. The turkey hearts are freeze dried while raw to maintain freshness, nutritional integrity, and flavor, while meeting the strictest food safety standards. Your dogs will love the rich flavor, and you can enjoy giving them pure, nutritious and guilt-free treats! Dr. Sinatra, a physician and certified nutrition specialist and dog lover, believes in choosing only the healthiest dog treats for our beloved canine companions. He likes organ meats because they are among the richest food sources of coenzyme Q10, a nutrient the body needs to make cellular energy. That is why he hand-selected this gourmet, freeze dried, healthy dog treat – because it is made with absolutely nothing but turkey heart. Whether for training or pampering, you can feel good about giving your pet these freeze dried dog treats. Turkey Heart Freeze Dried Treats Feeding Guidelines: As these freeze dried treats for dogs are made from fresh, raw poultry, handle with care – keep in sealed package and wash hands after handling. These turkey heart treats are for intermittent or supplemental feeding only, and are not a substitute for your dog’s main meal. Doggie treats, in fact, should be no more than 10 percent of your dog’s daily calorie intake. Both my small dogs absolutely love the turkey treats! I love that they are simply one ingredient!! *Reviewer received a free sample of these turkey heart freeze dried dog treats. Our 12 year old hound LOVES the turkey heart slices! I have three dogs. Finding a treat they will all eat is hard. My 1 yo Shih Tzu will eat anything. My 3 yo Papillon is a bit more picky, but my 9 yo Yorkie! OMG she is fussy! All three LOVE these treats. We found Ageless Paws at the Hartford Pet Expo and got a free sample of their turkey hearts. Giving one piece to our dog, she gobbled it up as fast as she could. We bought a full size bag on the spot. The heart slices are roughly the size of a half dollar or smaller and can be easily broken into smaller pieces. The people working at the booth were super friendly and knowledgeable. 100% will be buying only these treats for the rest of our dog’s life. Jackpot absolutely Loves the turkey hearts! she even knows the name now lol. what a great high value treat ..not often do they get organ meat and that is some of the healthiest for any of us. Our puppy gets one a day as a “special treat” Didn’t think she would eat them, but its a great treat that is good for them.